Religion is born of the same curiosity that led to philosophy and science, but it’s a premature birth due to an impatience for answers. 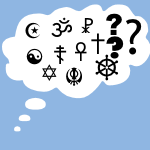 Before people started figuring things out with philosophy and science, people made up a variety of answers, and these became various religions. 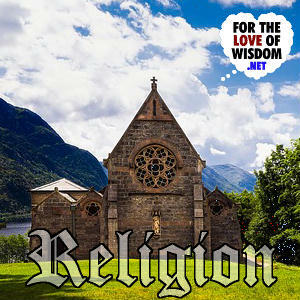 The articles in this section are on the topic of religion, on various topics within religion, or on particular religions. In her book Allah Is Dead: Why Islam is Not a Religion , Christian author Rebecca Bynum argues that Islam should not qualify as a religion when it comes to constitutionally-protected freedom of religion. Is she right? This post examines her position and how much freedom of religion Muslims or anyone else should be allowed. In her book Allah Is Dead: Why Islam is Not a Religion , Christian author Rebecca Bynum tries to distance Islam from Christianity, lumping it together with atheism, which she unfairly bashes. But her atheism-bashing is misinformed, as her values and atheist values are not so far apart. In recent years, we have heard of New Atheism, associated with atheists who have been openly critical of religion, particularly Dawkins, Hitchens, Harris, and Dennett. Some people seem shocked by this, as though they expect atheists to keep quiet about their beliefs. I recently read a book that easily fits in with New Atheism, except it was written in 1846. Do various religions, including Christianity, have their roots in the experiences gained from eating psychedelic mushrooms or plants? Could the story of the Tree of Knowledge of Good and Evil that Adam and Eve ate of in the Garden of Eden reflect the mind-blowing experiences of people who ate psychedelic mushrooms? In Allah Is Dead: Why Islam is Not a Religion , Rebecca Bynum frequently claims that Christianity is superior to Islam, and to do this, she often tries to lump Islam and Atheism together, as if they are both more alike than they are like Christianity. So there is lots of backpeddling, in which she will criticize Islam, then try to show that Christianity is not the same. 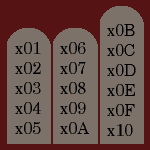 How would you improve on the ten commandments? What would you change, take away, or add? Here is my own attempt at improving the ten commandments. I have modified the first ten, sometimes substantially, and I have added six more for what I’m calling a Humanist Hexadecalogue. The Elements of Character begins with this quotation from the author’s former pastor, An exclusively intellectual education leads by a very obvious process, to hard-heartedness and the contempt of all moral influences. An exclusively moral education tends to fatuity by the over-excitement of the sensibilities. An exclusively religious education ends in insanity, if it do not take a directly opposite course and lead to atheism. When I was a Christian, I read plenty of C. S. Lewis. I read The Screwtape Letters , The Space Trilogy, and The Chronicles of Narnia . The first thing C. S. Lewis did for me was to present an expanded, more mythical understanding of Christianity.